Bunny Wesely, a lifelong resident of Owatonna died peacefully December 3, 2018 at Koda Living Community of Owatonna. Mass of Christian Burial is set for Friday, December 7, 2018 at 11:00 am at Sacred Heart Church in Owatonna. A parish Rosary will take place at 9:00 am at the church. Friends may greet the family from 9:15 – 10:45 am at the church on Friday. Bunny was born April 5, 1924 in Bixby. On October 16, 1945, Bunny was united in marriage to Charles Wesely at Sacred Heart Church in Owatonna. She was a homemaker and worked with her husband on the farm and held various jobs. The couple purchased a farm by Hope in 1950 and it was their lifelong residence. 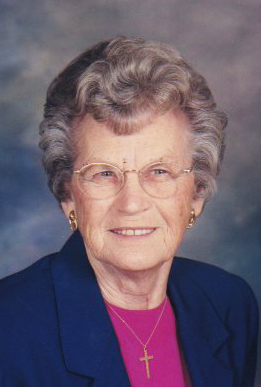 Bunny was a member of Sacred Heart Church, St. Elizabeth Circle, Owatonna Eagles, and was a 4-H leader. Bunny’s hobbies and interests include crocheting, sewing/quilting, puzzling, gardening, mowing lawn and picking sticks, planting flowers, listening to old time music and dancing, along with visiting with her neighbors and spending time with her family. Bunny will be missed by her children Sharon (Walter) Clark of Maple Plain, MN; Ronald Wesely of Fargo, ND; Susan (Dave Barkman) Wesely of St. Petersberg, FL; Sheryl (Greg) McLaughlin of Owatonna, MN. Her grandchildren Renee (Mike) Johnson, of Fargo, ND; Katie Clark of Maple Plain, MN; Stephen and Melissa Clark of Montrose, MN; Matthew and Shawna Evans of Apple Valley, MN; Michael (Andrea Warda) Evans; and Michelle Evans of Owatonna, MN and seven great-grandchildren. Bunny is preceded in death by her husband, twin boys, her parents and siblings.